Above: Milton Avery (American, 1885-1965). Swimmers and Sunbathers, 1945. Oil on canvas, 28 x 48 1/4 in. The Metropolitan Museum of Art, Gift of Mr. and Mrs. Roy R. Neuberger, 1951 (51.97). © 2019 The Milton Avery Trust / Artists Rights Society (ARS), New York. Image copyright © The Metropolitan Museum of Art. Image source: Art Resource, NY. On May 11, 2019, the Bruce Museum will open Summer with the Averys [Milton | Sally | March]. Featuring landscapes, seascapes, beach scenes, and figural compositions—as well as rarely seen travel sketchbooks­—the exhibition takes an innovative approach to the superb work produced by the Avery family. 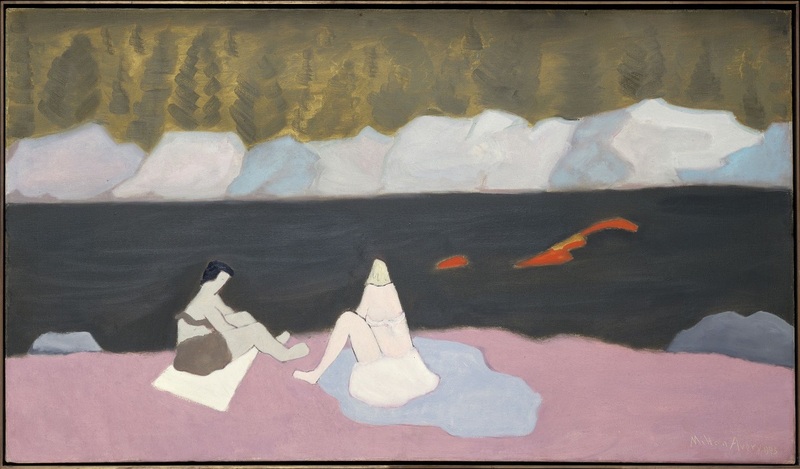 Along with canonical paintings by Milton Avery, the show offers a unique opportunity to become acquainted with the remarkable art created by Avery’s wife Sally and their daughter March. In the summer of 1924, while painting in the fishing port and artist’s colony of Gloucester, Massachusetts, Avery met young artist Sally Michel, whom he would marry less than two years later. They would return to Gloucester and elsewhere in New England for summertime visits during the following decade, sometimes with close friends Adolph Gottlieb, Mark Rothko, and Barnett Newman. After March Avery’s birth in 1932, the three Averys ventured forth over the years as far south as Mexico (including six weeks at San Miguel de Allende); west to Laguna Beach, California; and north to Canada’s Gaspé Peninsula. In addition to working vacations in Provincetown, Massachusetts, and Woodstock, New York, the Averys were artists-in-residence at the MacDowell Colony in New Hampshire and Yaddo in upstate New York. In the summer of 1952, the Avery family traveled together to Europe for their first and only time (although Sally and March would subsequently work abroad on many occasions). As it was for many artists before and since, summertime was a moment of heightened creativity for the Averys. Escaping from their hectic lives in New York, the three artists were inspired by these bucolic and sometimes unfamiliar settings. The art they produced—including oil paintings, watercolors, drawings, and prints—was filled with the splendor of natural phenomena and the sociability of family, friends, and acquaintances; the work ranges from the representational to the nearly abstract. Summer with the Averys [Milton | Sally | March] will be an opportunity to discover not only what Rothko referred to in 1965 as Avery’s “repertoire . . . his wife Sally, his daughter, March, the beaches and mountains where they summered,” but to observe the creative interaction of this exceptional family of artists. The exhibition is organized by Kenneth E. Silver, Silver Professor of Art History at New York University and Bruce Museum Adjunct Curator of Art, assisted by Stephanie Guyet, Bruce Museum Zvi Grunberg Fellow, 2018-19, and will be accompanied by an audio guide and a scholarly catalogue, featuring full-color illustrations of all the works in the show. Educational programming will include a talk on May 30 with the exhibition curators and Barbara Haskell, a curator at the Whitney Museum of American Art and Milton Avery authority. The exhibition closes on September 1, 2019. The Museum is grateful for exhibition support from the Milton and Sally Avery Arts Foundation, Guardian Life Insurance Company of America, Sotheby’s, Sylvia and Leonard Marx, Jr., Bank of America, The Charles M. and Deborah G. Royce Exhibition Fund, the Connecticut Office of the Arts, and a Committee of Honor Co-Chaired by Rebecca A. Gillan, Pamela Lawrence, Susan Mahoney, Heidi Brake Smith, and Jacqueline Adler Walker.